Adir in his home in Los Angeles. Photo courtesy of Adir Abergel. 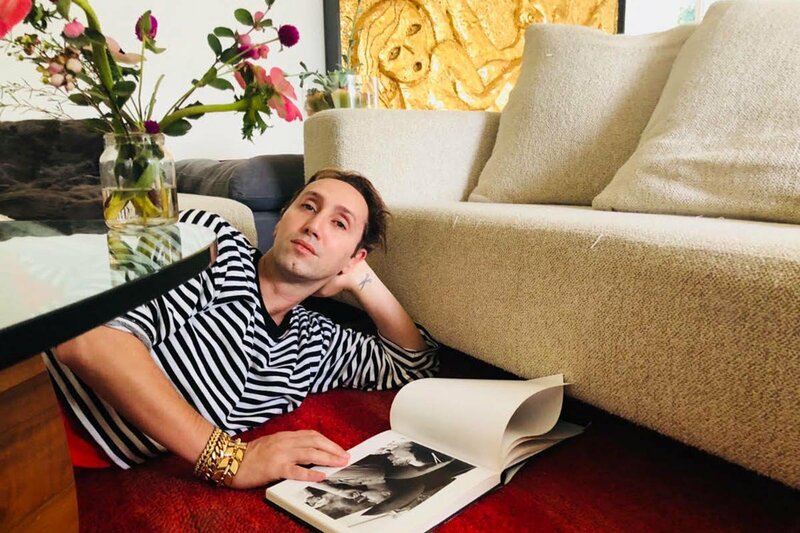 When celebrity stylist and Hollywood native Adir Abergel isn’t doing hair for celebs like Charlize Theron and Keri Russell, he’s exploring the world or his own LA backyard with equal amounts of verve and passion. LOS ANGELES - The beautiful city of Los Angeles is my home. I love this place — I love the natives and I love the transplants. Hollywood is where I grew up, right across from the Guitar Center on Sunset Blvd. I currently live in the extremely diverse South LA neighborhood Ladera Heights. Its rich history, central location (close to the airport), and mix of people make it a really special place. I’ve travelled the world and am lucky to have seen and experienced so much, but nothing feels like Los Angeles. These are my spots. 1201 South La Brea Ave.
One of my absolute favorite galleries, with an incredible roster of art on display, from younger talents like Rosha Yaghmai all the way to James Turrell. Located in the heart of Los Angeles, off La Brea Avenue, it's ten minutes away from my house, so I go whenever I have free time. One of the newer galleries located in Downtown Los Angeles (DTLA), a neighborhood with so many amazing places to eat and shop. The gallery is massive — 116,000 square feet — which makes huge exhibitions possible. (It also has a coffee shop and a restaurant.) I’ve been lucky enough to see the work of such world-renowned artists as Alexander Calder, Mike Kelly, and Louise Bourgeois. This interesting gallery relocated and just expanded to a beautiful space in Atwater next to Silverlake. My dear friend John Rubeli just joined as a partner, and he is a true lover and supporter of artists. When you come here, you can expect to see a show that’s both ambitious and experimental. Afterward, you can go horseback riding in Griffith Park and eat pizza at Hail Mary. How’s that for a perfect day? 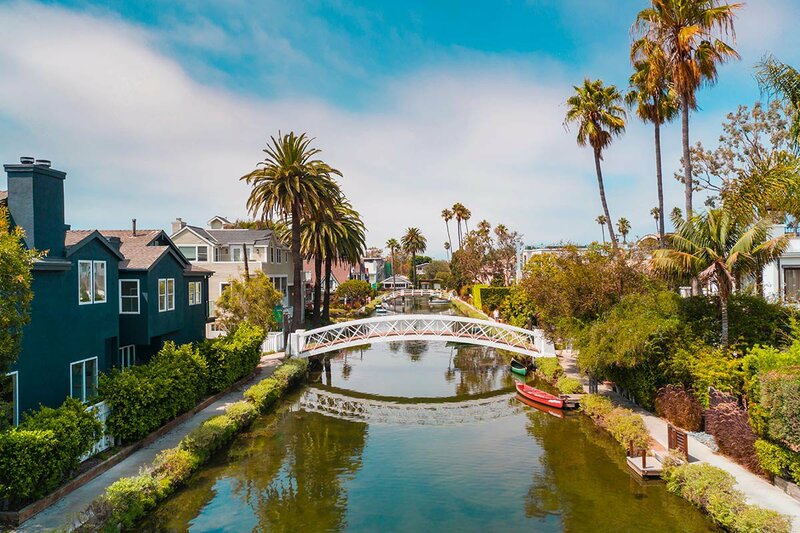 The Venice Canals are one of the best spots for a Sunday stroll, designed by Abbott Kinney (he was a real person!) in the early 1900s when he returned to the United States after living by the canals in Italy. People really take a leisurely pace here. (Again, just like Italy.) When strolling around the canals, you can forget the craziness of LA and can find peace in the micro oasis. It’s a two-minute walk to the beach and right down the street from Abbott Kinney Blvd., where there is great food and shopping. This library is one of my favorite places to get lost. I spend hours going through their archives for research and inspiration — for everything from interiors and fashion to science. You can go back to the history of everything. The architecture and access to experts make the library a true gem. Descanso is one of the most beautiful gardens in town. If you are into oxygen and trees, this place is for you: 150 acres of the most incredible varieties of desert plants, orchids, and tropicals. I can come with friends or be alone and enjoy the quiet. No matter how many times I’ve been, I’m taken aback by its beauty and wonder. It’s located in Pasadena, and my favorite time to visit is after spending a morning at the Rose Bowl Flea Market that takes place on the second Sunday of the month. My weekly obsession: walk into the flower market and get lost in the beauty. I try to go every Friday morning around 6 a.m. The flower market is so special because many vendors have been there for years, and I’ve built incredible relationships with them. Photo courtesy of Grand Central Market. The most delicious Italian food. The vibe in the main room is high energy, so I usually sit in the back room where it’s much quieter. My go-to order is grilled octopus followed by orecchiette with sausage and swiss chard. Just thinking about it is making my mouth water. The food speaks for itself. The quality of the meat is among the best in LA for Japanese BBQ. The neighborhood is a very trendy, primarily Japanese area, with plenty of other delicious Japanese restaurants, markets, and shopping. Very close to UCLA, the energy here is youthful and vibrant. 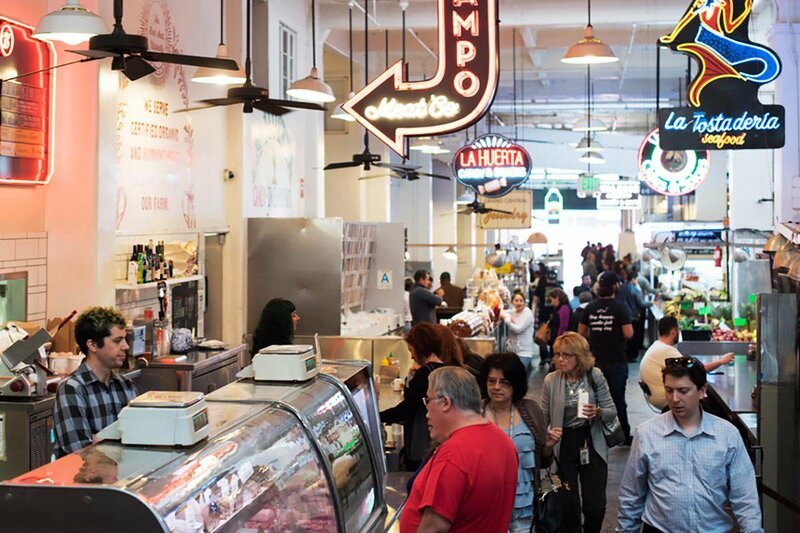 Downtown is so hot right now, and Grand Central Market is the perfect place to stroll on a empty stomach. From delicious fresh baked bread, gourmet cheeses, and freshly caught fish and oyster bar, you can find anything you crave. If it’s your first time, I’d suggest doing a walkthrough before committing to see all that GCM has to offer. My favorite spot is Lucky Bird for the fried chicken sandwich. Organic food and the friendliest local vendors abound at the largest farmers' market in California. I like to go right when it opens to avoid the heavy crowds. The best chefs from LA’s top restaurants come here for the largest selections of fresh fish, produce, and meat. When I want to treat myself to an incredible massage and an even more incredible massage table, this is my spot. A traditional Japanese spa and one of the best in town, I like to get their two-hour signature massage, especially after I’ve been on the road for a few weeks. A traditional Korean bath house that’s very family-friendly, affordable, huge, usually very busy and lively, and conveniently open 24/7. You can get scrubs, massages, and have a delicious Korean meal all in one place. My husband and I have been going for years — it’s one of our favorite places to relax and unwind. Craig has saved my life! I’m on my feet all day, and having back and shoulder issues doesn’t help. A genius at what he does, Craig is a chiropractor by trade who focuses on orthopedic and acute pain management. His theory on the body is unlike any I’ve ever heard. When I want to get the most out of a cardio workout, this is my spot. The trail is made up of 282 intense calorie-burning steps leading to a beautiful scenic overlook of the city. The best time of the day to go is sunrise. 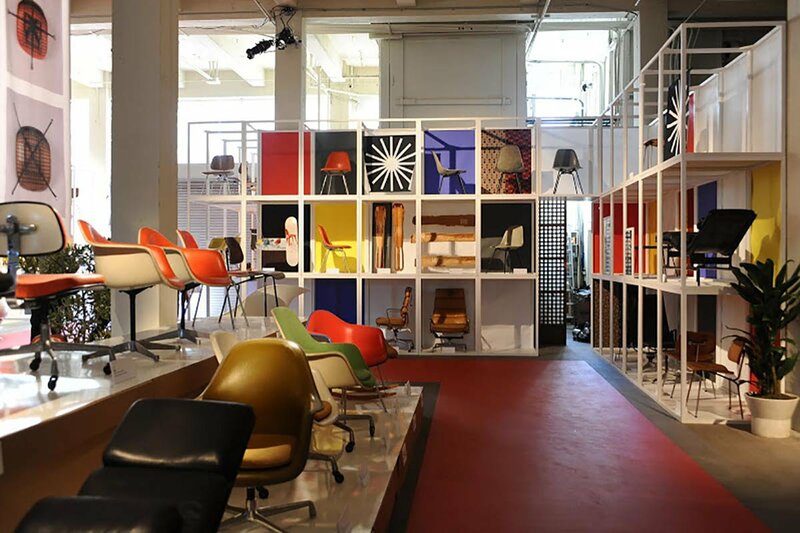 Collection of Eames chairs. Photo courtesy of JF Chen. For all things vintage, this collective of vendors will blow your mind. You can find everything from art and jewelry to home furnishings and clothing. I can get lost in this space for hours. I once found a beautiful African woven basket from the early 1900s. It is still one of my favorite pieces. Some of my most beautiful furniture comes from this store. (My latest find is an incredible wooden lamp for my dining room.) JF specializes in decorative art, as well as eclectic period pieces and 20th- and 21st-century work. Laura Freedman has the most incredible eye. She’s curated some of the most tasteful pieces (home decor, unique vintage) and jewelry collections in the city. The shop is conveniently located in the Brentwood Country Mart, close to the post office, shops, and delicious restaurants, and she also has outposts in Los Angeles, Costa Mesa, and on Crosby Street in New York City. Adir is a hairstylist, creative director, and Hollywood native living in Los Angeles. You can find him at @hairbyadir on Instagram. He travels for the inspiration.